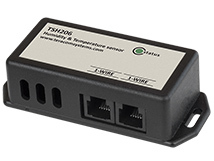 TSH206 is our new sensor for humidity and temperature, utilizes 1-Wire interface. He is the successor of TSH203. The humidity sensor is housed in a plastic box and has two RG11 connectors for easy connection of several sensors in a daisy chain. The sensor comes with a special detail that ensures easy installation of 19″ racks. TSH206 uses primary capacitive sensor element. The resulting analog signal is processed with 14 bit precision of integrated analog-to-digital converter. In further digital processing provides a fully calibrated digital output signal across the operating temperature range from -40 to +85 degrees Celsius. The sensor provides temperature measurement accuracy of ± 0.4 ° C, while accuracy for the measurement of humidity is ± 3% RH. TSH206 is ideal for monitoring and control of humidity and temperature in buildings, public facilities, data centers, etc. It is compatible with controllers TCW122, TCG120, TCW220 and TCW241.